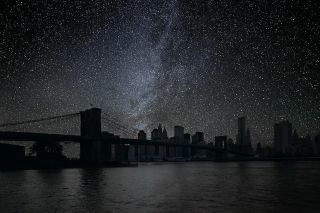 The Brooklyn Bridge stands starkly against a sea of stars. The sky photo was captured in Black Rock Desert, Nevada. NEW YORK - NASA astronauts are taking over New York City this week for the World Science Festival. Space agency scientists and engineers are giving presentations around New York from now until Sunday (June 1) on a variety of topics. Some astronauts will discuss their work and what it's like to fly in space, while others will help New Yorkers look up at the stars from the Brooklyn waterfront. If you don't happen to be in the city this week, the World Science Festival will also have some events streaming live online that anyone can watch for free. For a full list of streaming events, including links to the webcasts themselves, head over to Space.com's sister site Live Science, to watch the World Science Festival broadcasts. From WSF: "Great minds inspire greatness in others, which is why the Pioneers in Science program gives high school students from around the globe rare access to some of the world’s most renowned scientists. This year, students will engage with British astrophysicist, Lord Martin Rees. Now the prestigious Astronomer Royal, Rees has worked on everything from black holes and quasars to quantum physics and the Big Bang. During this intimate gathering, he’ll share his personal stories, life challenges, and career highlights, all toward inspiring the next generation of scientists and explorers." From WSF: "Join the World Science Festival and the Intrepid Sea, Air & Space Museum for a first of its kind evening that includes a special screening of “Gravity,” under the space shuttle Enterprise, conversations with astronauts, stargazing, a search for exoplanets, after-hours access to the Exploreum Interactive Hall, and more." NASA astronauts John Grunsfeld and Sandra Magnus will take part in the event. Richard Garriott, a space tourist that flew to the International Space Station for about two weeks, will also be in attendance. Former NASA engineer Mark Weislogel, astrophysicist Mario Livio, planetarium professional Ted Williams, NASA engineer Bobak Ferdowsi and astrobiologist Paul Davies round out the list. From WSF: "In space, water becomes a spherical ball, hovering in the air. Plants grow sideways. Humans lose muscle mass. Without earth’s gravity things behave…well, differently. Such is life—and science—aboard the International Space Station, where the extremes of microgravity make possible a whole new class of cutting-edge experiments ranging from fluid dynamics (try drinking a cup of coffee that won’t stay in the cup) to vaccines, and research about the origin of the life to predicting natural disasters. ISS scientists join middle school students from across the country in a virtual classroom that brings research at 240 miles above earth’s surface right down to earth." NASA astronaut Sandra Magnus, NASA engineer Mark Weislogel and NASA scientist Tara Ruttley will participate in the event. From WSF: "Great minds inspire greatness in others, which is why the Pioneers in Science program gives high school students from around the globe rare access to some of the world’s most renowned scientists. This year, students will engage with NASA astronaut John Grunsfeld, veteran of five space shuttle flights and multiple spacewalks. Grunsfeld helped repair the Hubble Space Telescope and until recently managed the science program for the James Webb Space Telescope. During this intimate gathering, he’ll share his personal stories, life challenges, and career highlights, all toward inspiring the next generation of scientists and explorers." From WSF: "An interdisciplinary study has grown out of the search for the origins of life, and collaborative plans for the next twenty years of this hunt are underway. Our panel will discuss the potential of three high-tech pieces of equipment: Starshade, a flower-shaped shield to block excess light and reveal distant Earth size planets; TESS, the Transiting Exoplanet Survey Satellite that will measure the brightness of roughly 500,000 stars; and the famed James Webb Space Telescope, infrared successor to the Hubble Space Telescope. The technology will advance the research in many areas of the research. In labs, what do chemists hope to cook up in the next twenty years? Thinking about the future has biologists, astronomers, and physicists alike working collaboratively to be ready for what’s on the horizon." Participants include astronomer Dimitar Sasselov, exoplanet hunter Sara Seager and biologist Jack Szostak in a panel moderated by Mario Livio. From WSF: "Get out your telescope (or come borrow one of ours) for a night of urban stargazing and live music as we celebrate the dance of the planets. Learn even more about the universe at our Star Chat, where some of the world’s best astronomers, physicists, and scientists will discuss hunting for life, landing crafts on Mars, and discovering planets trillions and trillions of miles away. Gear up for the Rosetta Mission that is slated to land on a comet later this year by visiting our model comet with interactive programming. Finally, get a taste of what it’s like to be an exoplanet hunter with NASA’s interactive game, The Hidden Light, and enjoy finding your favorite constellations without ever leaving the city." NASA astronaut Mike Hopkins, NASA engineer Bobak Ferdowsi, NASA scientist Steve Howell, Mario Livio and Christina Pease will take part in the event.